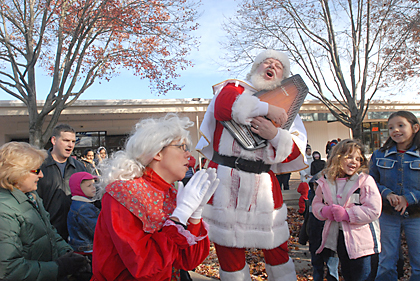 SANTA BELTS IT OUT: Santa’s got his mojo working at The Princeton Shopping Center’s Christmas party Saturday. The way Mrs. Claus (Shopping Center Manager Chris Hanington) is clapping along, Santa might be performing “Jinglebell Rock” or maybe he’s rocking out on “Santa Claus is Coming to Town.” Santa arrived courtesy of Princeton Hook & Ladder. Snowy the Snowman also made an appearance, and a good time was had by all. While Princeton Township’s governing body and residents appear to be in agreement over an apparent need for market-rate senior housing somewhere within the municipal border, deep divisions remain over where that housing should be located, and a debate over senior housing Monday night will continue into the new year. Representatives of the Nassau Inn will appear this Thursday before the Regional Planning Board of Princeton with a concept that would offer significant increases to the hotel’s guest capacity, retail capability, and reception space. A Princeton area landlord and Township resident is being charged after accusations that he offered false information to tenants regarding their housing. He is also being charged with racketeering and consumer fraud. Princeton’s own astronaut Greg Olsen — the third private citizen to orbit the earth on the International Space Station (ISS) — visited the Henry Pannell Center last Thursday to talk about the experience with children in the Princeton Young Achievers program. In 2003, a letter authored by then-Borough Mayor Marvin Reed to Township Mayor Phyllis Marchand, indicated that, after 70 years of joint-municipal use of the Princeton Sewer Operating Committee land on River Road, perhaps it was time that the two Princetons maintained joint ownership of the land. The Lewis School has appointed Lisa Settle Callaway as its new director of development and Robert P. Martinez as director of strategic planning. Mr. Martinez currently serves as project manager for the school’s proposed new campus. Lincoln Gunn had just produced one of the best all-around games in his career with the Princeton University mens basketball team but he wasnt happy. Showing attention to detail at both ends of the ice, the Princeton University mens hockey team roared out of the gate this season with a 3-0 start. The group of seniors that graced the ice for the Princeton High boys hockey team last winter wont be soon forgotten.